Like the root of a plant or the headwaters of a river, my strategy for finding the lifeblood of a country is to find the farmers, the cultivators. Bogota has a pulse all its own but I knew I would find Colombia’s heart in its hills, and I took off from the city to the pueblo of San Agustin, a 12 hour bus ride to the East. The town is beautifully tucked into lush green hills and right along the Rio Magdalena, which is born here and flows all the way through Colombia up to the Caribbean coast. Skirting the town are a variety of farms and fincas- small farms- that grow coffee, maize, sugar cane and other produce that make this one of Colombia’s most important agricultural regions. After some online investigation, I found work on a finca called Finca Viracocha that offered an inexpensive place to stay and a daily lunch that would challenge the volume of my stomach, in exchange for 4-5 hours of work, six days a week. Finca Viracocha is the breadbasket of Fundacion Viracocha, an organization that advocates for sustainable agricultural and proper nutrition, and seeks to put healthy food in the bellies of kids in the community who don’t have access to it. 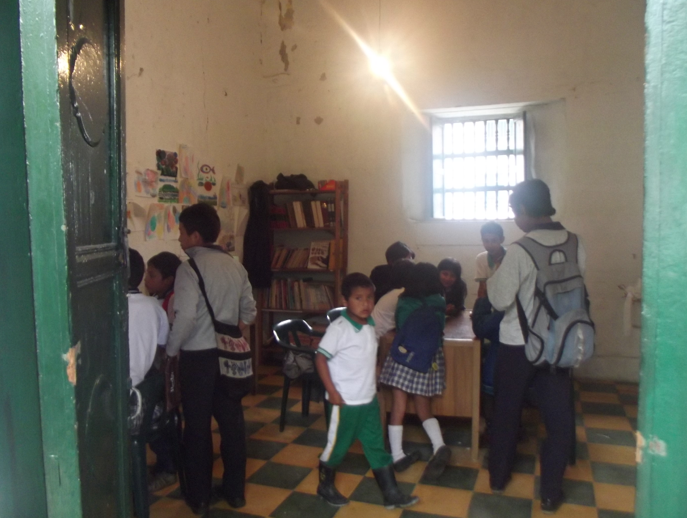 The kids learn, eat and play well at the Fundacion and I have to say the same about myself. The finca employs full-time campesinos in addition to volunteers, and though they offer volunteers food, accommodation and practice permaculture, they are off the WWOOFing radar. I am farming with an Argentine, a Chilean from the Patagonia and three Colombians on a day to day basis. 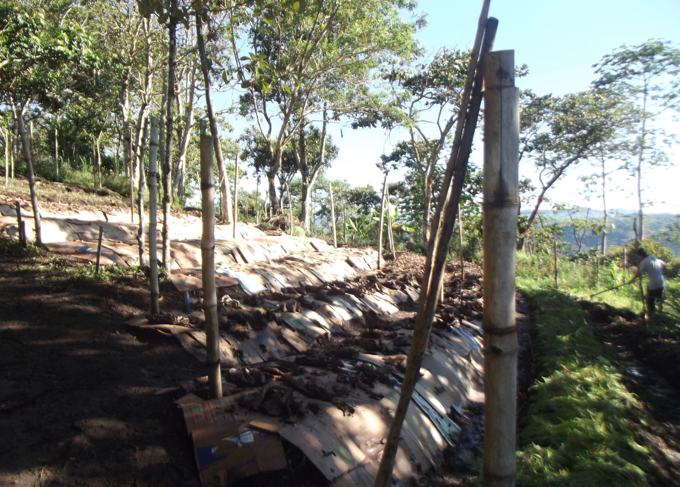 The first few days on the finca, we were digging up raw earth to make a fish pond, and when I reached my bed at the end of the day, I fell asleep instantaneously. It was the most satisfying sleep I’d had since working as a sea kayaking guide in Alaska the summer before. In the morning we start at about 7:30, but not until we’ve had a cup of the most mind-jolting, delicious coffee, grown in the region. Sometimes there’s a newspaper we can sift through together and then we set off to work at a steady pace that is broken up by several “cafecitos” (coffee breaks). Having admitted to the group that I’m 21, eliciting responses along the lines of “tu eres una niña!” (you are a child! ), at times I feel like I have to prove a level of maturity beyond the others’ expectations. I never feel inferior because I am the only woman farming every day. The campesinos and other volunteers are incredibly kind and, as there have been all types of volunteers through here before me, gender doesn’t even seem to be on their radar. At night, the other volunteers and I cook dinner together over a wood stove, using fresh herbs and avocados from the farm and we make juices from the fruit falling off of the trees. Every other Saturday, the parents of the children receiving food and education from Fundacion Viracocha must come to the finca to help for several hours and it is incredible to see teams of hard working mothers and fathers harvesting so many kilos of produce in a single morning. One of these mornings, I farmed with an 80-year-old man that had the smile of a 12 -year-old. I found Colombia in that smile, I found Colombia listening to reggaeton on the back of a motorcycle making hairpin turns through the canyons of Rio Magdalena, I found Colombia elated, resilient, genuine, and defined by the most beautiful appreciation for life and for sharing this appreciation. I have come to love this country in a way I have never loved a country before, horse poop and all.